If you’ve ever traveled along Interstate 35 in northern Iowa, you have definitely noticed the town of Clear Lake. The last major exit as you drive north out of Iowa, or the first major exit as you enter Iowa from Minnesota, for most travelers Clear Lake is a cluster of gas station chains and fast food restaurants. 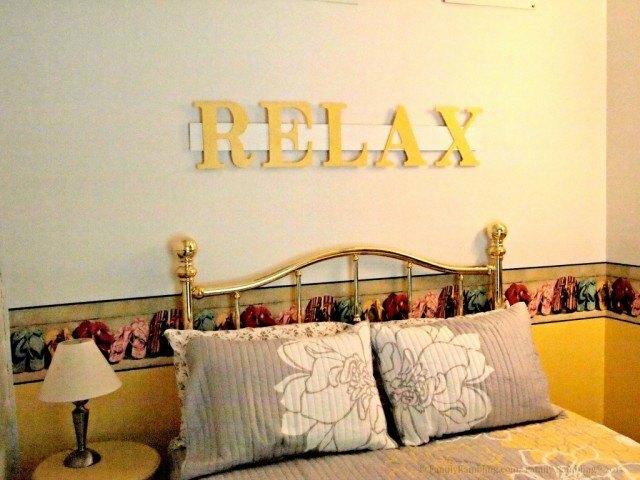 What most miss is the charming resort town just a short distance from the interstate. Though I have often passed through – and by through I mean stopping at a gas station for fuel or a quick bite- Clear Lake, I haven’t spent any time there. A speaking engagement in nearby Mason City presented the perfect opportunity for a short stop. The day was colder and drearier than I had hoped it would be when the speaking engagement had been made. My girls and I arrived at our rental condo at The Harbourage on the shores of Clear Lake just before an icy blast from the north brought freezing rain and snow. An afternoon wandering the shops of downtown Clear Lake was out of the question. A summer vibe all year! Fun dining bar opens the kitchen and creates more space. The condo, provided for our overnight stay by Clear Lake Rentals, was wonderful for an afternoon indoors. My girls went immediately to the large loft area where they amused themselves playing imaginary games about towers and fair maidens before retreating into Minecraft to build the new world they had just imagined. 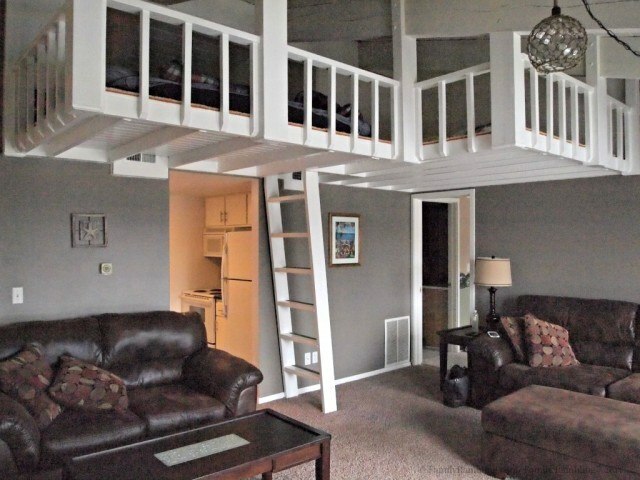 My girls loved this loft! I relaxed on the couch for a bit, watching the lake water form icy white caps as the winds blew. The marina below was still half frozen. 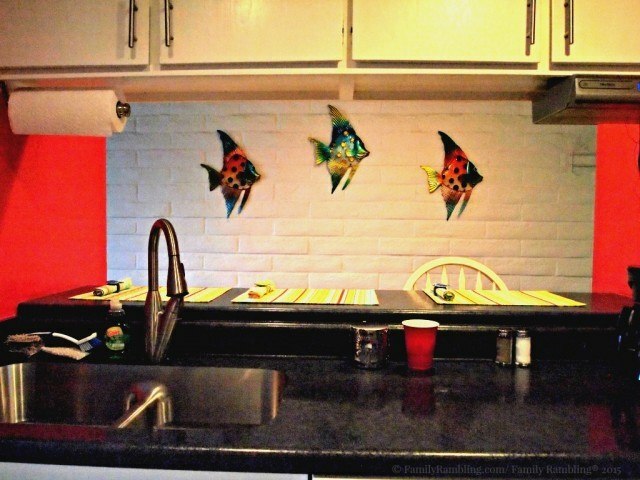 I imagined the condo was as wonderful a getaway for ice fishers in the winter as it is for warm weather vacationers in the summer. I had easily slipped into the ‘Relax You’re at the Lake’ mentality, but I had work to finish – mainly my talk for the next morning. Thankfully my outline was nearly complete, and the task was easily finished. With an afternoon still before us, the girls put on their swimsuits, layered their clothes over them, and donned winter coats. 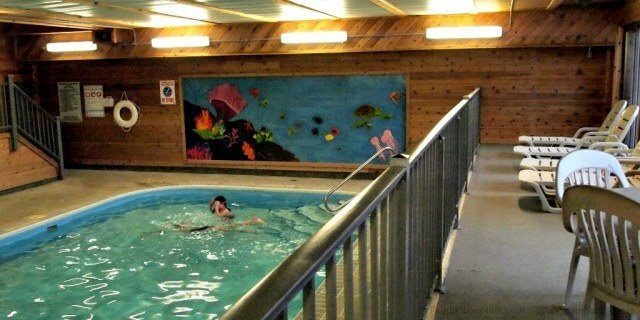 The short walk to the indoor pool was chilly and wet, but inside those walls was tropical. Splashing and playing for 90 minutes was the perfect escape for the cooped up energy after our drive. When I had asked the group I was coming to speak to where we should go for dinner, the response was unanimous – go for pizza at The OP. The Other Place is a large sports bar located along Highway 18. On the Tuesday night we visited the huge room was nearly empty, only a few booths were being used and a handful of men sat at the long bar, enjoying an after work beverage and conversation. We were seated promptly, though when I asked if we could be moved to a nearby table to better watch the hockey game, it was treated as an imposition. Our waitress, though competent and able to answer my questions, seemed to be having a bad night. I let my girls choose the pizza – half All Meat Supreme, half Hawaiian – and ordered a Cheesy Bread Stix appetizer and side salad. The side salad was average – iceberg lettuce, a slice of cucumber, a slice of tomato, and croutons. The dressing selection isn’t large, and the creamy Italian was simply ok. The Cheesy Bread Stx, however, were fabulous. Completely covered in melted cheese that stretched as you pulled the stix apart. A ‘cheese attack!” according to my daughters. And the marinara was wonderfully chunky and tasted home made. The All Meat Side looked tasty. But the Hawaiian… well, it appeared to be an onion & pepper pizza with a couple pieces of pineapple. The one slice my daughter was able to eat had only a single piece of pineapple on it. And, unfortunately, some peppers had crossed to the other half of the pizza, rendering it inedible for me, though the girls both said it was really good.When my waitress returned and asked how everything was I expressed our dis-satisfaction with the Hawaiian half. I may have used the word ‘inedible’. She merely shrugged her shoulders and walked away. It was about this time that another employee appeared and yelled across the room, “I just got fired!” And then she didn’t leave, but stayed and joked around with people. Was it a ruse? I have no idea, but it certainly made us a bit uncomfortable. Maybe we visited the OP on an off night. Maybe the kitchen was out of pineapple and decided to ‘make up’ for it with extra onions & peppers. Maybe there was something brewing with management and the staff was tense. I don’t know. I do know that the bread stix were awesome. 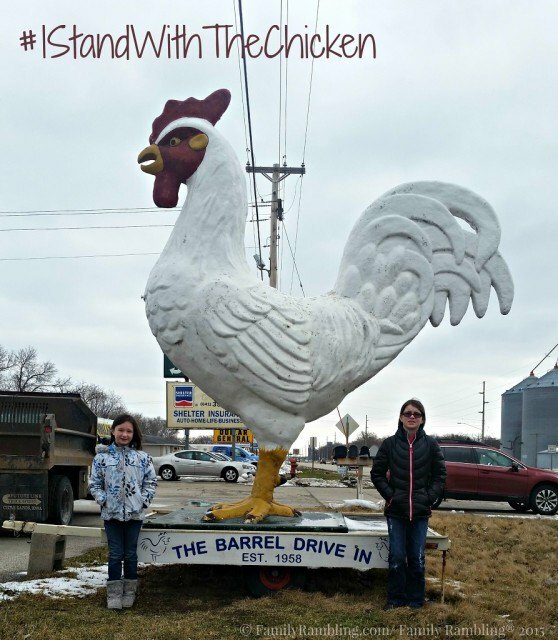 Following the Social Media Breakfast, where I spoke about social media and how to manage it when you’re a small business, Sara Broers (the event host) invited us to lunch at The Barrel Drive In with a few of her North Iowa Bloggers. 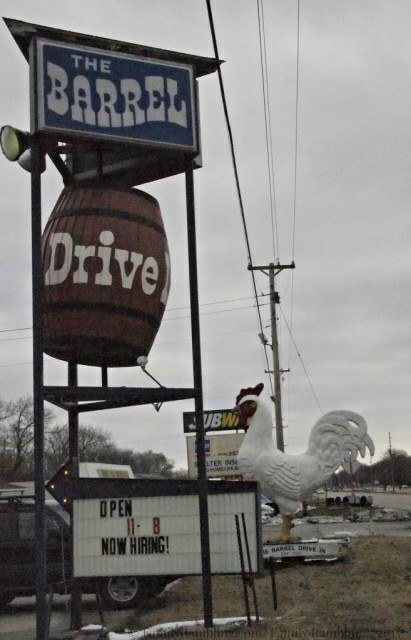 The Barrel Drive In, also along Highway 18, has been a Clear Lake institution since cars had fins and car hops wore roller skates. The Barrel nearly closed last year, ownership of an aging business nearly forcing owner Seth Thackery into bankruptcy. A plea in the local newspaper for help quickly drew community support both online and off and #SaveTheBarrel began. Over the past winter, when the drive in was closed for the season, volunteers were hard at work replacing, repairing, and rejuvenating the space. Our group met in a spacious dining area at the rear of the building, a space the owner plans to expand with a patio before summer begins. Our waitress was spunky, with a hip vibe that channeled the 60’s while appearing completely modern. She took our orders efficiently, and wasn’t flustered as people trickled in, adding to her workload. Though The Barrel is known for their broasted chicken, I had the grilled chicken sandwich. A simple salad preceded my sandwich, the house made French dressing a pleasant surprise. 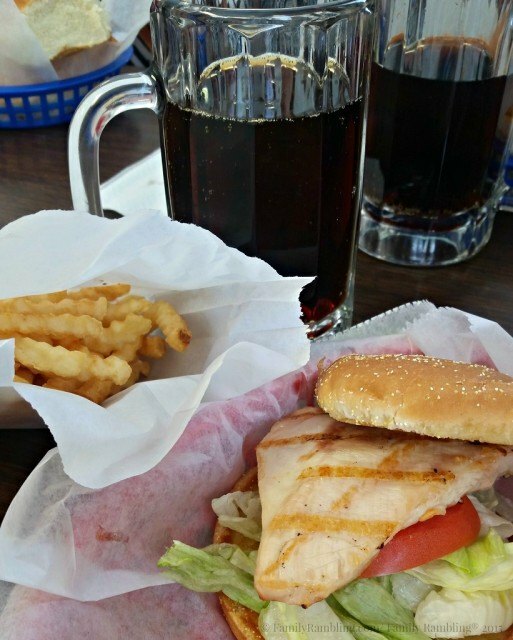 The sandwich isn’t overly fancy – lettuce and tomato layered on the bun with the fresh chicken breast – it was the simply kind of tasty that leaves you satisfied. The ‘drive in’ portion of the restaurant is closed until summer, but we have plans to camp in the area and I hope to return on an evening when the roof-top DJ booth is spinning tunes and the parking lot is filled with classic cars. 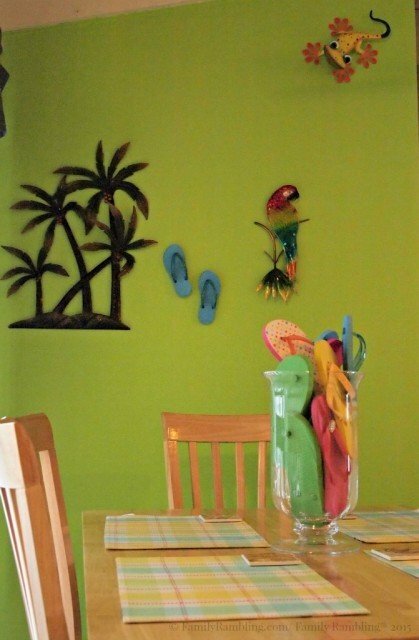 Until that time, our stops in Clear Lake will take us away from the interstate and into the heart of town where you really get a flavor of this summer resort. So glad to have had the chance to meet you and your lovely daughters. Thank you for sharing your expertise and sense of humor with us at Social Media Breakfast. Sorry about your experience with the OP –I have only eaten there once myself and it was “okay” but not stellar. The Barrel is going to be a big deal again, I am sure of it. Thanks again for making the trip! Thanks to you all for inviting me! You have a lovely, open group. It was my pleasure. I can’t wait to return the The Barrel this summer – would love to see it ‘hoppin’! It’s always great to see you and the girls and to get a “Goldie The Cat” update from the youngest. Thanks for coming up to #NorthIowa. Thanks Pat! it was great to see you, too! Thanks so much for speaking. I really enjoyed meeting you and your girls. They gave me great tips on Minecraft 😉 I love the Barrel! Thank you, Donna. I’m sure the girls loved talking Minecraft with you! I hope you will be able to visit Clear Lake agai soon with enough time to reaaly explore all that the area has to offer! There is SO much more here to experience! Thanks for commenting, Kay. We do plan to come back for a longer stay this summer. I enjoyed reading your piece. I am so sorry that you had a bad experience at The O.P.. My family has encountered a few of them ourselves but we continue to go back because we’ve had more good then bad experiences. But you will NEVER go wrong with The Barrel Drive-In! Best place in the area! Their homemade french dressing is delicious and I always have the broasted chicken. I guess I am a creature of habit. Hope the next time you visit our area you have better weather and can enjoy the great outdoors! Thanks for your comment, Christie. We will likely try the OP again as those Cheesy Bread Stix were amazing. And we will definitely return to The Barrel! Other restaurants/food joints to try on your next trip…Half Moon (clear lake), Anchor Inn (clear lake), Viking drive-in (ice cream stop on a ‘lake lap'[drive around the lake], Ventura), Colony Inn (Ventura), PM Park (weekend breakfast) and Tiki Bar (outdoor)(clear lake south shore) SIPS Bar & Grill (clear lake), Starboard Market (lunch)(downtown clearlake), And 2 restaurants with waterfront access: Muskie Lounge (ventura/N shore) and The Landing (clearlake/S shore). I’ve lived here my whole life and been a server/customer at all places listed and can vouch for good food/atmosphere at ALL listed businesses. Hope to see you this summer! Thanks for the recommendations Denise! If you’re going to be blogging about food, you should know restaurant terms. “I just got cut” does not mean “I just got fired”. If simply means that particular position is off duty for the night. The Hawaiian pizza at the OP is one of the best! Filled with pineapple ONIONS and PEPPERS! It even states that on the menu! Rumor has it, you were offered an onionless and pepperless pizza if you wished, since it was “inedible”. 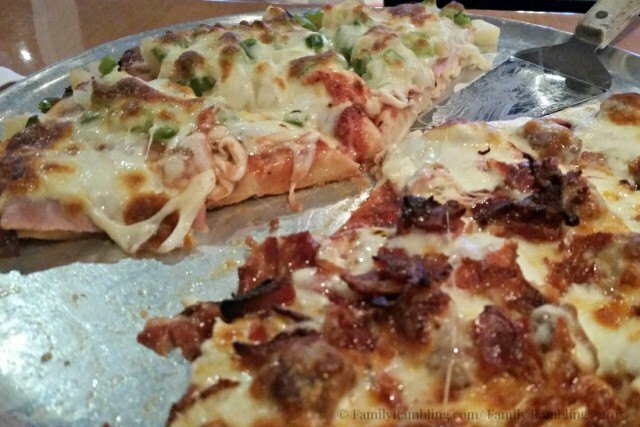 The OP continues to be one of the highest known restaurants in northern iowa. It has the best atmosphere and delicious food! Everyone should give it a try, and remember to read the ingredients in the menu! Hi Anon. I so appreciate you taking the time to comment even if you won’t share your identity. I do know restaurant terms having worked in restaurants previously. The employee’s EXACT WORDS were “I just got fired!” She did not say ‘cut’. And rumor is wrong. We were not offered a replacement pizza. Our waitress did not make any offers, but just shrugged her shoulders and left our table. Had she made any offers you would have read a review filled with praise for her terrific customer service. As to the onions & peppers- yes, the menu does state that. The menu also says there is pineapple on that pizza, which was not the case with ours. A single piece of pineapple on a slice does not a Hawaiian pizza make. I’m sorry if my first hand experience offends you. But again, my experience is all I have to go on. And, as I was there and all you have are ‘rumors’, well, I think that speaks for itself. Can you please give the whole story. Because your said server left your table when you started yelling at your daughter. Bringing her to tears. I don’t know a single person who would stand around and watch that. Please stop with the lies. Well hello again. I did not yell at my daughter, nor did she cry. I let my girls order the pizza toppings that night. I did not check up on them, as they know enough to be thorough when ordering. They also know that green peppers make me incredibly ill. So, yes, I was upset with my daughter for not being thorough. But I did not yell, nor did my daughter cry. I understand that you are upset that I did not have a good experience at your favorite restaurant. But it would seem that the side of the story you are getting is a bit embellished. I really hope you give the OP another chance. I’m so sorry you had a bad experience. My family and I eats there all the time and the food is amazing I also work there and have for years. I’m truly upset that this happened to your family. Please don’t let the person questioning your experience keep you away. We love to have you back and show you what we are really about!!! Thank you for your comment, Bobbi. As I told Sara (below) we had completely planned to return. I appreciate your invitation. Jody- I am sorry that so many of us in the North Iowa Social Media Breakfast Club recommended the OP to you. It is obvious that you will never return and I do not blame you. I respect you as a writer, as you are honest. I had actually planned to return as I know that everyone has bad days. And, like I said, the Cheesy Bread Stix were really good! But being attacked for sharing our experience does make me reconsider returning, especially since (as another comment pointed out) there are so many restaurants in Clear Lake to visit. I thank you for your support, Sara, and look forward to visiting your group- and North Iowa again. We will welcome you and your family! Jody, I appreciate your honesty in your review. Like you said…every place and everyone has bad days..even the best of restaurants. Saying you will try them again is fair! The great thing about living where we do is our freedom to voice our opinion. I think you did so very well! We welcome you back to North Iowa anytime…and your opinions, good or bad! First of all, thank you for coming to visit us in North Iowa. If you return, I hope we get a chance to meet in person:) I commend you for writing about your experiences honestly. 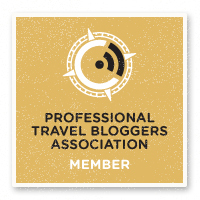 There are too many bloggers who do not. The anonymous person is actually reflecting badly on the OP which is unfortunate. Plus, most people do not give much regard to those who are too cowardly to take ownership of their comments online. If you return, I agree that the Landing is a really fun place to eat. The time we visited, we enjoyed live music on the lake. Also, Rookies is one of our favorite places. You can order food from Sevens in both the bar (Rookie’s) and the restaurant. It’s affordable and better than average. They have fresh salads too and homemade lemon vinaigrette. Glad you could make it to The Barrel Drive-in. Thanks for commenting, Jeni. I’m sorry we didn’t get to meet and I hope your husband is doing well. I think the problem of sharing honest experiences comes into play when bloggers are compensated or hosted for meals. You feel the need to say only positive things. Which is why the majority of my travel and dining is paid for by me. And when it isn’t, I am clear about it. Thanks for the dining recommendation! Thanks for sharing your humor and wisdom at the North Iowa Social Media Breakfast. So glad you enjoyed your stay with Clear Lake Rentals and had the chance to try a couple of our many fabulous restaurants! As has been said, places do have days that are less than stellar and this must have been the case at The OP as we’ve always enjoyed our meals and time there. 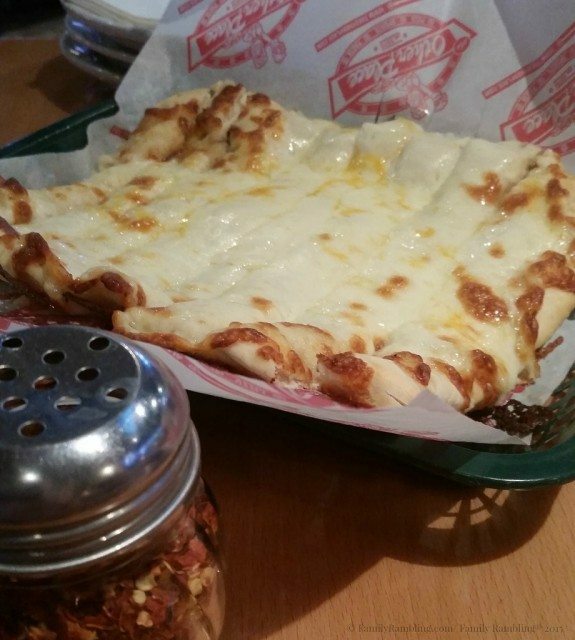 And yes, the “cheesy bread” IS delicious! I too #StandWithTheChicken and truly enjoy the experience and food there. I know when you return to Clear Lake you will find a tremendous amount of great things to do and fabulous places to eat. #NorthIowa has much to offer! Thank you so much for your comment, Jenny. We look forward to future #NorthIowa visits! Thanks, Jody, for visiting us in North Iowa and sharing your story along with some very useful tips at Social Media Breakfast Club. I especially appreciate the time you spent with me after the meeting assessing my itinerary for my upcoming trip to Ireland. Your suggestions are duly incorporated into my plans. I also appreciate candor in reviews of restaurants and other businesses. While I like to focus on the positive, it feels dishonest to never mention where improvement is needed. I especially like it when the business owner/manager thanks the customer for honest feedback and invites them back for another experience. That’s professionalism. Please come back to North Iowa soon. We have so much to offer. Thanks for commenting, Laura. 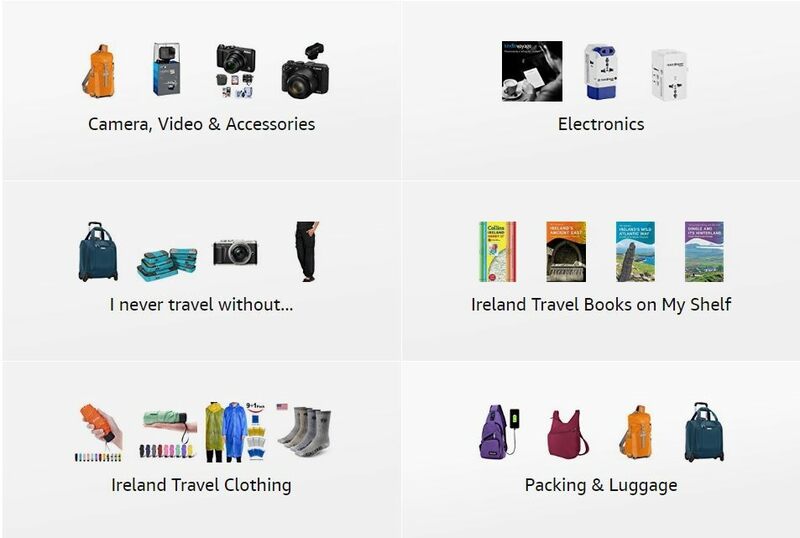 I hope you have an amazing trip to Ireland with your family! I actually received a message via Facebook from The Other Place. It was very kindly worded, thanked me for visiting, and hoped we would try the restaurant again. Incredibly professional. Unfortunately the restaurant supporters are harming him more than I ever could…. A note to my readers: I have begun deleting anonymous comments to this post as they have become threatening and do not add to the conversation. I apologize for the way this has played out here and hope it will not affect your impression of The Other Place as management does not support these comments. You never know who might be in a restaurant. Sure, the “I just got fired” comment may have been in jest, but a visitor to your town would have no way of knowing that, would they? To the commenter who made un-printable remarks about my child, thank you for providing your IP address. And to the commenter who called me a ‘talentless hack’… You are welcome to your opinion. The publishers of outlets like The Huffington post, Fox News Travel, Yahoo Travel, and TLC (yes, the network) don’t think so as my work has appeared in all of them. As always, I welcome discussion on Family Rambling. But when name-calling and threats begin to appear I refuse to feed the trolls.